Founded in 2002, TBWA\WorldHealth is a global healthcare marketing services network that brings together expertise from professional and consumer agencies. It combines medical science and professional and patient insights with TBWA’s proprietary strategic approaches of Disruption and Media Arts. According to executives, the global network pledges to help create a healthier world through simple yet engaging ideas that inspire genuine behavior change. This has helped it secure solid relationships with more than 100 healthcare clients, including Bayer, Bristol-Myers Squibb, CooperVision, Ferring, Galderma, Gilead, GlaxoSmithKline, Ipsen, Johnson & Johnson, Lundbeck, Novartis, Pfizer, Otsuka, and Roche, among others. Network leaders say 2013 was a year of healthy growth thanks to significant senior personnel appointments, major account wins and important new assignments that strengthened the network’s relationship with its existing global clients. 2013 saw the strengthening of the leadership team, with highly experienced individuals adding their talents to offices in France, Germany, Switzerland, the United Kingdom, and the United States. In France, the return of veteran Sean Yap to the TBWA group as Head of International Business boosted the agency’s efforts in bringing strategic business value to clients, over and above the agency’s core competencies. In London, Beth Moore was appointed Head of Strategy at TBWA\Paling Walters, alongside incoming Executive Creative Director Diana Janicki and new Managing Director Steve Morris, who brings many years of TBWA experience to the role. Meanwhile, Bernd Hofmann joined TBWA\WorldHealth Munich as Client Service Director. During his career Bernd has worked with some of the biggest brands in the sector. The team in Switzerland was also strengthened with Simon Raschle as Head of Strategy. R.Shane Kennedy joined the TBWA\Chiat\Day New York office as Managing Director, TBWA\WorldHealth. With his primary focus on the U.S. market and additional global duties for TBWA\WorldHealth, and as a member of the GSK Key Accounts team, he brings significant healthcare experience in digital, consumer, and HIT. In Mexico, Veronica Trujillo, best known for her acute brand insights and analytical approach, was appointed Managing Director of the office that she joined in 2010 as Creative Director. There was also news in Turkey, where a new digital department was created specifically to handle tablet detailing, apps, broadcast and coding. As a consequence of this influx of talents, the network won a series of global assignments that reinforced its relationship with its clients at an international level. On a network-wide basis there were assignments from Pfizer, Gilead, Lundbeck/Otsuka, Ipsen, and Ferring. There were also impressive account gains across the globe. In Belgium, assignments from AbbVie; in Denmark, work from Pfizer Brands; in Germany, assignments from Ipsen for cancer treatment Tasquinimod, as well as new brands from Bristol-Myers Squibb and Pfizer. Spain was also awarded new Pfizer work, while Switzerland won new assignments from BMS, Blomed, and Medela. London is heavily present in the roster of new wins with work from Pfizer for Enbrel and, as mentioned earlier, Ipsen, Gilead and Lundbeck/Otsuka. The U.S. office under the leadership of R. Shane Kennedy also shone with new work from J&J alongside the network-wide business from CooperVision. Another U.S. highlight was the launch of GlaxoSmithKline’s first-in-class nicotine replacement therapy, an oral strip that begins to reduce the urge to smoke within 50 seconds. The agency developed TV, print, outdoor and online assets which will roll out worldwide for NiQuitin Oral Strips. The network also did some significant public relations work. One major initiative was the launch in Brazil of World Diabetes Day on November 14. The PR hook of the campaign, created by Lew’Lara\TBWA, involved “officially” changing the name of Rio de Janeiro’s famous Sugarloaf Mountain (Pão de Açúcar) to Sugarless Mountain (PãosemAçúcar) for the day, generating immense media buzz. In the United States, the agency has partnered with conference organizer and health community TEDMED as a contributing partner in a strategic and digital role. Another alliance was forged in Japan, where consumer health agency TBWA\EG joined forces with local independent HCP agency La Nouvelle Place to form TBWA\WorldHealth Japan. The venture has already begun a collaboration with Pfizer. In 2013, CAHG (see profile on page 62) launched three important drugs: Gilead’s Sovaldi, Bayer’s Adempas, and Otsuka/Lundbeck’s Abilify Maintena. The network won numerous awards in 2013. TBWA\Paling Walters in the U.K. was a top prize winner at the Global Awards for its work for RMD virology. Its work for Roche RMD also scored IPA Best of Health bronze awards in two categories. France won Prix Emprientes for Exforge (Novartis) and Glaucoma Grand Angle (Alcon). The German agency scored Gold in the Comprix competition for its BMS/Orencia mailing and campaign for the Deutsche Diabetiker Fund. Mexico’s TV spot for Levitra (Bayer) won its category at the Aspid awards. In Spain, work for Vichy Pharmacy’s Aminexi won Gold at both the Inspirational Awards and the El Sol awards. 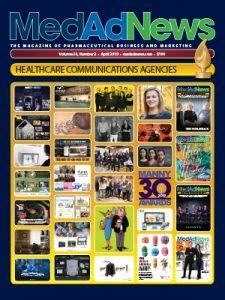 Turkey won nine awards in the National Healthcare Communications Contest. TBWA\WorldHealth is led by Scott Cotherman, Chairman, and Hervé Brunette, President International. Cotherman is also President and CEO of CAHG, the lead U.S.-based agency within the network. The network serves global, regional and local marketers of pharmaceuticals, medical devices, consumer/OTC healthcare brands, health service organizations and wellness brands. It comprises 48 offices in 36 countries, with international hubs in New York, Chicago, London, Paris, Hamburg, Singapore and now Mexico City. TBWA\WorldHealth offers comprehensive brand-stewardship services to support clients’ pharmaceutical brands – from prelaunch to post-patent – as well as OTC and consumer health brands with integrated solutions. Services include brand and franchise strategy, creative development of traditional advertising and sales support, digital strategy and execution, CRM, salesforce incentive programs, market research, medical education, market access, clinical trial recruitment, PR, strategic publications planning, crisis management, KOL management, event marketing and congresses, prepress and studio production and local and international asset management. Over the coming months TBWA\WorldHealth plans to strengthen its presence in Asia and the Middle East. As well as growing in developing markets and innovating in the digital field, the network will continue to pursue global assignments while creating success for clients by remaining at the cutting edge and putting Disruption and Media Arts at the heart of everything it does. TBWA\WorldHealth demonstrates its commitment to helping create a healthier world with concrete initiatives. In addition to World Diabetes Day, charity-related work included a pro bono campaign for LILT (the Italian League Against Cancer) and work in Turkey for the Foundation for Children in Need of Protection. Additionally, TBWA took Tolstoy to a mental health conference in Seoul. The agency created an interactive app based on the book “Anna Karenina,” full of questions about life and relationships. Users could also attend a seminar on the responses of classic literature to life’s dilemmas.